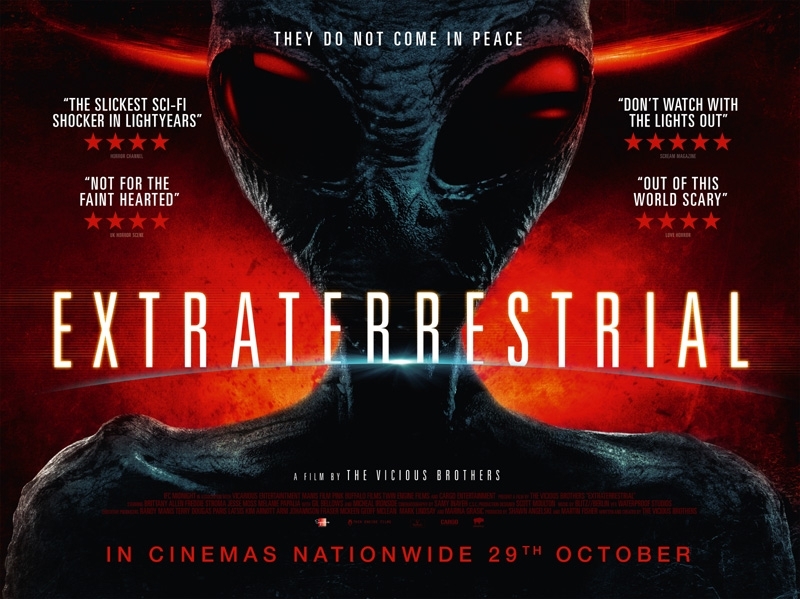 Hitting VOD outlets on October 17th and limited theaters on November 21st is Extraterrestrial, the latest from the duo known as the Vicious Brothers (Grave Encounters). In this particular take on an alien invasion, the dudes with the big round heads are most definitely looking to do more than phone home. While we wait for the impending invasion, check out a brand new UK poster for the film, courtesy of Empire! Freddie Stroma and Brittany Allen star in the indie feature produced by Randy Manis, Kim Arnott, Shawn Angelski, and Martin Fisher. From The Vicious Brothers, the creators of Grave Encounters, comes a different kind of encounter, one of EXTRATERRESTRIAL origin. Still reeling from her parents’ divorce, April (Daytime Emmy winner Brittany Allen) is dragged back to the vacation cabin she spent fond summers at as a child accompanied by a group of friends. Her trip down memory lane takes a dramatic and terrifying turn when a fireball descends from the sky and explodes in the nearby woods. Lead by her boyfriend, played by Freddie Stroma (Harry Potter & The Half Blooded Prince, Pitch Perfect), the group venture out toward the crash site and discover the remnants of a ship from another planet along with footprints that suggest its alien occupants are still alive. The college friends soon find themselves caught in the middle of something bigger and more terrifying than anything they could ever imagine.